I’m a Yelper. I can’t help it. I’ve tried to kick the habit, but the foodie nerd in me possess zero control. As someone who watches the Food Channel on a regular basis (and not just at Planet Fitness. Why do they do that?) nothing is more satisfying than to enter a restaurant, hop on Yelp and let the world know I HAVE ARRIVED. And say what you will, but once I gained my first Yelp-Dukedom over someone named “Donner-Party-Of-One” at my favorite brunch spot there was no going back. I am saving the dining world one check-in at a time. But Peculiar Culinary Company. They fight my Yelping abilities. I can’t pin these guys down. One minute they are over here with an open-faced pork belly sangwich and the next minute they are somewhere else offering up a gorgeous looking cataloupe gazpacho. They have built up a pop-up exclusivity that drives my pallet mad with anticipation of what Chef Gene could be offering next. Northeast, PA is lucky to have these guys, even if they deny me my online royalty. 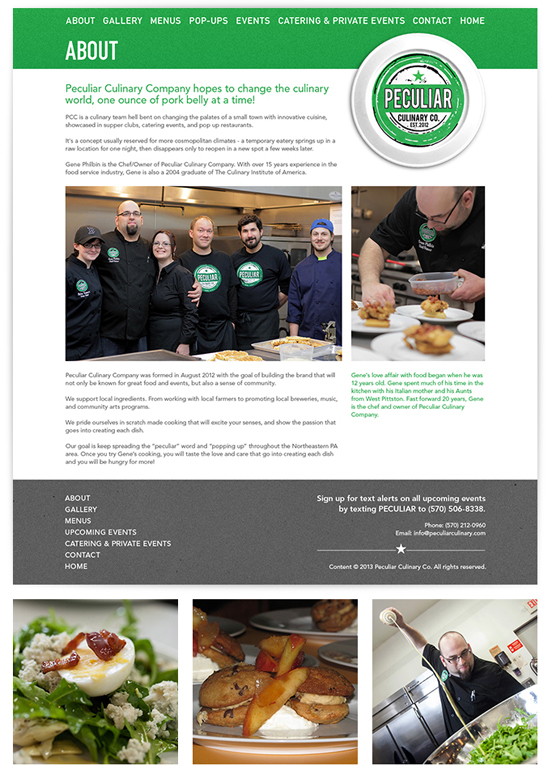 Until then I’ll have to be satisfied knowing that Blackout Design was able to provide Peculiar Culinary with an awesome new website. Using their previous logo, Phil gave the entire site a fresh and open design to match the company’s independent mantra. If you haven’t had a look yet, stop over. Its the closest you’ll get to capturing these illusive culinary artists.